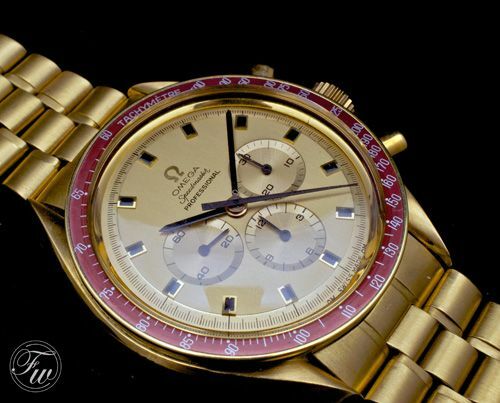 Only 1014 have been made of this gold OMEGA Speedmaster Professional in 1969 of which 28 went to the White House and 26 of them were given to the NASA astronauts of that time. Number 1 was offered to President Nixon, but he declined it. This particular watch is on display in the OMEGA Museum in Biel. Above is a picture that I took of the President’s watch when I was in Biel last year. Anyway, this week’s Speedy Tuesday is featuring this special gold Speedmaster Professional ref. BA145022 from one of our long-time readers. 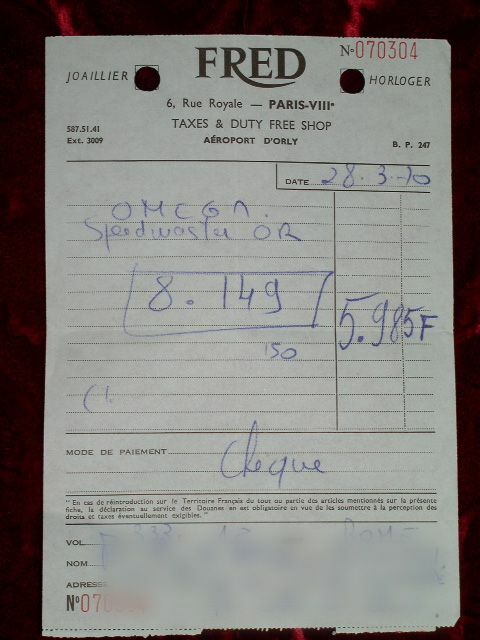 Originally bought in 1970 as you will see on the receipt. This watch was sitting in my mail box for a long long time and it is so special that it needs to get some awareness here on Fratellowatches. The burgundy color tachymeter is simply mesmerizing on this watch and the onyx hour markers were seen as luxury in that time period, as we’ve seen on a few other OMEGA watches as well (Constellation for example). 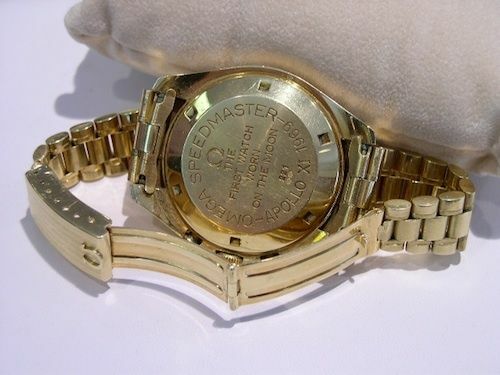 Whilst the ‘regular’ Speedmaster Professional 145.022 already had a printed logo on the dial (since 1968), this gold Speedmaster Professional version carried the applied OMEGA logo on its gold dial. There are two versions of the 145022BA’s caseback, as described in one of our previous articles on this rare Speedmaster (click here), this particular model features the second version of the case back with the typical ‘First Watch Worn On The Moon’ inscription. Inside, the ‘standard’ caliber 861 Lemania movement was fitted. A movement that has proven to be just as trustworthy for NASA missions (officially tested in 1978) as its column-wheeled predecessor caliber 321. The original owner (the mail was sent by his son, some time ago) bought this watch at Fred in Paris for just under 6000 (French) Francs. Not sure what that amount would be converted to today’s prices, but a new gold Speedmaster Professional lists for around 20K Euro. In all honesty, we prefer to have this one. Click for the Omega Museum in Biel. Keep sending us photos of your Speedmaster(s) to speedmaster(at)www.fratellowatches.com!